In a 2012 TED talk titled “The Clues To A Great Story“, Pixar animator Andrew Stanton gave some fast facts about Pixar’s successes while creating Toy Story. The essence of his pitch laid in five tips: No songs, no “I want” moments, no happy village, no love story, and make me care. That last part is perhaps the most pertinent. Well, in 1966’s Disney movie The Jungle Book, there’s a plethora of songs, one of them titled “I Wanna Be Like You”, a happy village, and a romance that’s rushed at the end of the movie. Oh, and it didn’t make me care about Mowgli, Baloo, Bageera, Kaa, Shere Kahn, or any of other jungle animals in this predictable, by-the-books story. Removing me from the experience was perhaps the movie’s biggest violation. Oh, I admit there’s a lot going on in The Jungle Book. Based on a collection of short stories of the same name by Rudyard Kipling, The Jungle Book tells the story of Mowgli (Bruce Reitherman), a human orphan who was adopted by the jungle animals and taken care of throughout his youth. One day, the jungle wolves find out that Shere Kahn (George Sanders), a vicious tiger who has a intense hatred of human beings, has returned to the jungle and wants to kill Mowgli. In an effort to protect the boy and save him from Shere Kahn, Mowlgi and his friends Baloo the bear (Phil Harris) and Bageera the black panther (Sebastian Cabot) travel throughout the jungle to return Mowgli to the man village, where he will be reunited with his kind once again. Back to the TED talk. When Stanton gave his presentation, he gave it knowing the genre’s conventions and with what audiences are used to seeing. Case in point, the singing, the on-the-nose “I want” moments, the happy villages, and the love stories. How many times have we seen each of these? Indeed, how many times have we seen it in most of the Disney movies, dating all the way back to Walt Disney’s first animated feature Snow White and The Seven Dwarfs in 1937? Disney has used and reused these elements over and over again through the likes of Cinderella, Lady and the Tramp, and Sleeping Beauty, and seeing those elements repeat again in The Jungle Book definitely doesn’t help in its representation. The film’s premise is not the worst in the world. It had good ideas of man versus nature that it could have been explored very well, and might have even stood out in a long line of conventional Disney pictures. The problem is The Jungle Book is incredibly rushed, and character’s motivations are not explored much deeper beyond their surface value. Mowgli, for instance, wants to remain in the jungle instead of traveling to live in the man village, but we’re never told why. We assume its because the jungle is where his wolf pack family lives, but since they only appear in the first 15 minutes of the film and are never referred to again, that reasoning quickly diminishes. 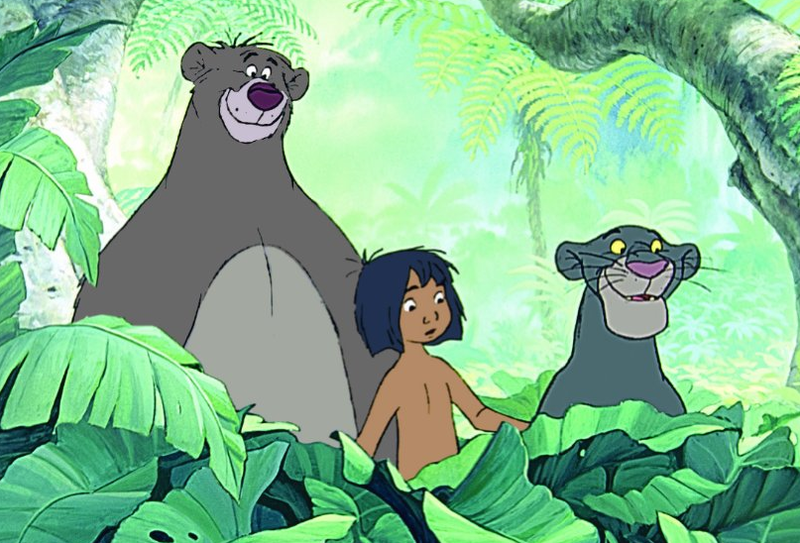 Baloo is a laid back and easygoing bear that wants to raise Mowgli as his cub, which is not only creepy and silly, but also just plain nonsensical. Why does Baloo want to raise Mowgli as his cub after mere minutes of just meeting him? Why does Mowgli trust this big, brutish bear that could eat him in a heartbeat to be his bear dad? Why are they more concerned about relaxing and chilling in the jungle when they both know that a man-eating tiger is after them? Which brings me to Shere Kahn. He is perhaps the most underdeveloped of any of the characters, which is the most frustrating to me because he has the most potential for development out of any of the other characters. We’re told that he is a tiger that hates human beings. Okay, why is that? Was there some deep, traumatizing experience where mankind crippled him for life? Did he lose his tiger family to a human tribe? Did mankind kill and take his food supply? Why does Shere Kahn hate mankind? We’re never given a reason. Shere Kahn just hates man, and Mowgli is a man, and that’s supposed to be it. There’s no complexion to their relationship, just typical archetypes that could be written by any screenwriter that has a thought in their brain and a head on their shoulders. I acknowledge that the movie is fun, that is without exception. The characters, while flat and thinly written, do have interesting and unique personalities, with the most memorable character being an ecstatic orangutan named King Louie (Louis Prima). The musical numbers are the opportunities where character’s personalities shine the most, and their silly, wacky, and fun energy takes over the screen like an Elephant herd stampeding through the jungle. While the movie is definitely too conventional for its own good, I must admit that I had fun with the music and I especially liked seeing the characters sing along to them. It’s the parts in between where the movie slows down to a crawl. I look at this movie, and I think of how many Walt Disney pictures came before that did so much better at involving its audience than The Jungle Book did. Look at Pinnocchio. Look at Fantasia. Dumbo. Bambi. Peter Pan. Look at all the wonder, the excitement, the feeling of adventure that those movies provoked. Look at those characters, their ambitions, and their reasons for having those ambitions. Look at the magic they instill, the sense of creativity and imagination in their journeys. Yes, those characters had songs, wants, happy villages, and love stories in their movies, but they all did one very important thing that The Jungle Book forgot to do: they made me care. When Baloo sang “Bare Necessities” to Mowgli, I didn’t know the audience was supposed to take it literally. Walt Disney certainly did. A little robot proves that emotion isn’t a malfunction after all. If there is any film that shows a greater maturity can be reached with something as simple as a children’s film, WALL-E proves that very point perfectly. 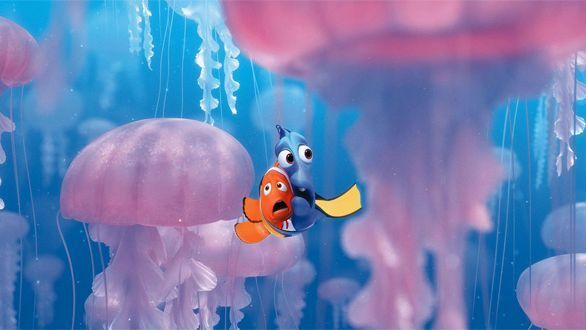 It’s everything you’d expect from a Pixar movie and more. Yes, the animation is gleaming and beautiful. Yes, the story is touching and poignant. And yes, the main character is as funny and entertaining as he is sympathetic and lovable. But oh, is this film much more than being just a simple kids movie. Much more. Taking place on planet Earth in a dystopian future, WALL-E (Ben Burns) is the last of a line of robots tasked with cleaning up the earth after the human race left it in a state of filth and desolation. After they left centuries ago onboard a space ship called the AXIOM, WALL-E is the last active robot who continues to engage in his duties day in and day out on planet earth. During all of his time on earth, however, he begins to develop something some technicians might call a “malfunction”. He begins to develop a conscious: a heart. Time passes as days turn into years, and on one day just like any other, WALL-E encounters EVE (Elissa Knight), a probing bot tasked with retrieving something on planet earth for the AXIOM to analyze. 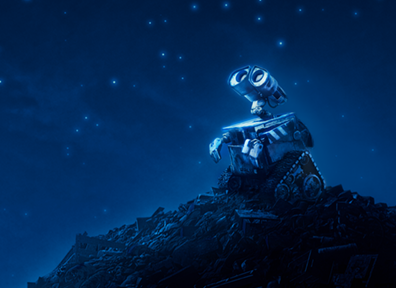 WALL-E cannot help but feel infatuated by EVE, and their meeting launches into a space adventure of involving, epic, and emotional proportions. You need to see this film just for the plain simple fact of seeing it. WALL-E is a bright, beautiful, stylish, and visually stellar film that astonishes the audience through its rich amounts of animation, colors, computer graphics, and textures. There’s quality in the environments in WALL-E, a vibrant and lively texture that makes the world of WALL-E not only great to look at, but also make it look real. Whether WALL-E is traveling on the chaotic and anxious AXIOM, working on the desperate, garbage-infested planet Earth, floating over the lonely, dusty surfaces of the moon, or flying peacefully through the stars in outer space, WALL-E is great to look at because of its authentic, detailed computer animation. WALL-E is a great-looking film. More than that though, I’m impressed by the story and the themes that are being expressed to us through those visuals. Written and directed by Andrew Stanton, the same man who wrote and directed Finding Nemo, WALL-E is a space adventure filled to the brim with imagination and creativity. You would typically expect this considering this is Pixar, but even by those standards Stanton outdoes himself. 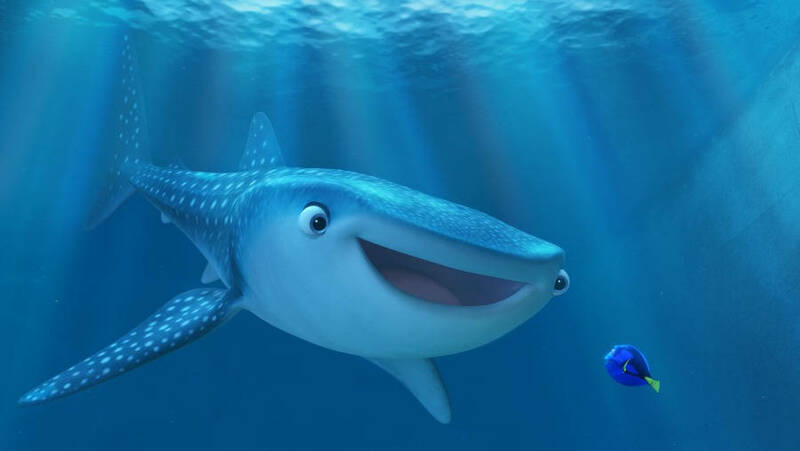 Similar to Finding Nemo, Stanton once again manages to make a story that is not only funny and light-hearted, but also deep and significant to its audience. In this story Stanton develops a nice theme of consumerism and environmentalism, though he does it in a subtle way to which it doesn’t overwhelm the story or annoy the audience. He does this through simple scenes where we see an American flag sitting on a cherished historical landmark long ago, but a slow pan reveals an advertisement for an upcoming BUY N’ LARGE mall coming soon. Stanton is effective here as a storyteller, as he deliberately uses pace, subtext, and soft, quiet moments to make the greatest impact upon his audience. And finally, there are the characters, who are written and animated here with such life and uniqueness that it is hard to forget them once you leave the theater. EVE is a determined, upbeat, and enthralling spherical robot who is just as intimidating and confrontational as she is enthusiastic and sincere. A small robot named MO is such a clean freak that he will stalk you around an entire space station if your shoes aren’t clean. And then there is WALL-E, the robot who is so curious, clumsy, funny, brave, heartfelt, and full of wonderment that his heart is as full as any flesh-and-blood human being’s can be. Again, the majesty and craftsmanship of WALL-E is to be admired. To the younger audience, it is a children’s film about a curious little robot exploring the universe and finding love. You wouldn’t be wrong if you made that assessment, but that’s only the surface of the story. To the older audiences, WALL-E is a fantasizing and amazing story encompassing the totality of human nature, the preservation of the environment, and what would become of planet Earth if humanity does not take care of their home. Kids will like the movie because WALL-E is quirky, funny and lovable. Adults will appreciate it for the deeper intentions.